The first of a series of paintings which try and convey winter, using colours more suitable for warmer paintings. These colours are the same as the last few paintings, Burnt Sienna, Cadmium Yellow and Prussian Blue. In fact this might be the only painting of this series. The yellow is so intense and its tinting power so great, the overall look is bright and warm. Because I use so few colours each individual one is involved in almost every mix. As you can see the painting glows a warm summery tint, not what was intended. The quick fix would be to use less yellow but again with only three colours, the painting would be unbalanced lacking greens and oranges, two essential colours in a natural landscape. There is no medium used and only the smallest amount of solvent (White Spirits). This is manageable as the painting is small, 9″ x 12″, but spreading ‘dry’ paint is difficult and time consuming. The advantage is a more textured effect, good in a small painting to suggest details, as painting details is difficult at such a small scale. I will review this painting in a day or two and decide whether or not to continue to paint winter scenes using Cadmium Yellow. As usual I recorded the painting process for the next post, see you then. 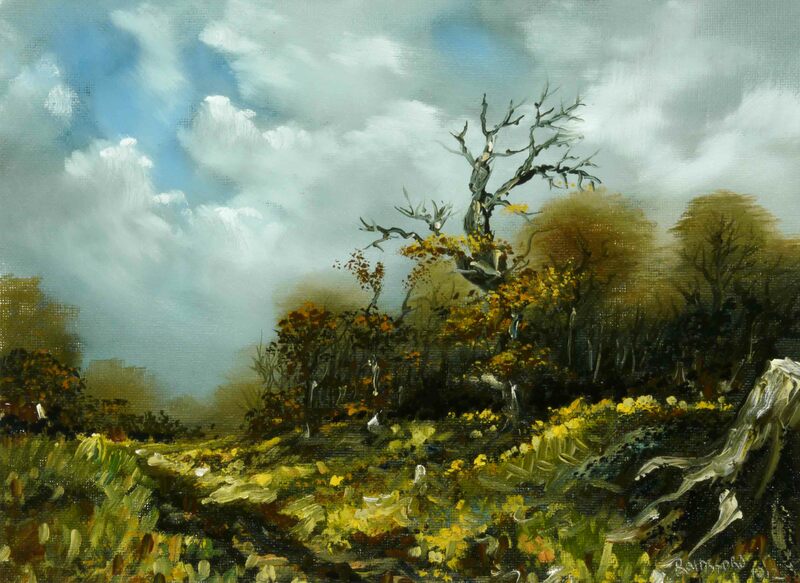 This entry was posted in Oil Painting and tagged Art, autumn, Culture, Education, fall, Inspiration, Irish landscape, Medium, Oil Painting, Oil Painting Instruction, Oil Painting Landscape, painting, Pictures, simple, Solvent, Trees, Woodland. Bookmark the permalink. This ones fantastic. I love that way that old snag just grabs up at the sky. I feel the wind blowing through the trees. This painting is lovely. I am so, so enjoying your recent paintings. Keep up the great work. You are a master with color. Autumn is certainly a colourful time, great inspiration. I know it is very “yellow” but still it is a colder yellow than the summer pictures- maybe it looks wintery because of the winter sky, but I think the colours have that burnished autumn colour, the way they look as they fall into winter. BEAUTIFUL! Thanks Emily, there is a change afoot, new colours on the way. Terrific tree, and the clouds are sweeping through the sky. This is exceptional – very lovely composition. The tree trunk and bare tree are great counterpoints to the softness of the rest of the landscape. I think the yellow works, you do capture October light. I do appreciate your tips about handling featureless spaces. I am working on a still life and there is one area of the background which won’t resolve. I think I may be able to progress now. Thanks for liking a recent post of mine. I’m delighted you found the post helpful. Good luck with the still life.